A 'Network Zone' can consist of an individual machine (including a single home computer connected to Internet) or a network of thousands of machines to which access can be granted or denied. Background Note: A computer network is a connection between computers through a cable or some type of wireless connection. It enables users to share information and devices between computers and other users within the network. Obviously, there are certain computer networks where you need to grant access to, including your home or work network. Conversely, there may be other networks where you want to restrict communication with - or even block entirely. Note 1: Adding a zone to this area does not, in itself, define any permission levels or access rights to the zone. 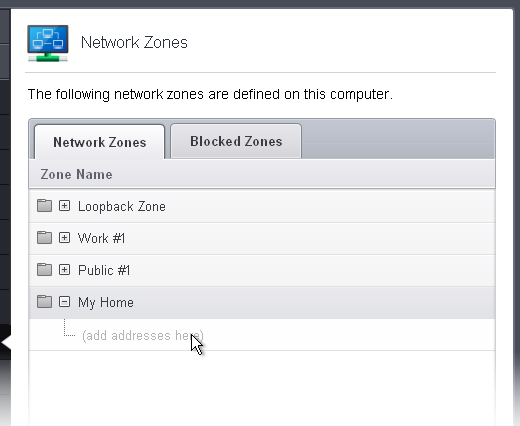 This area allows to define the zones so you can quickly assign such permissions in other areas of the firewall. Note 2: A network zone can be designated as 'Trusted' and allowed access from the 'Manage Network Connections' interface(An example would be your home computer or network). 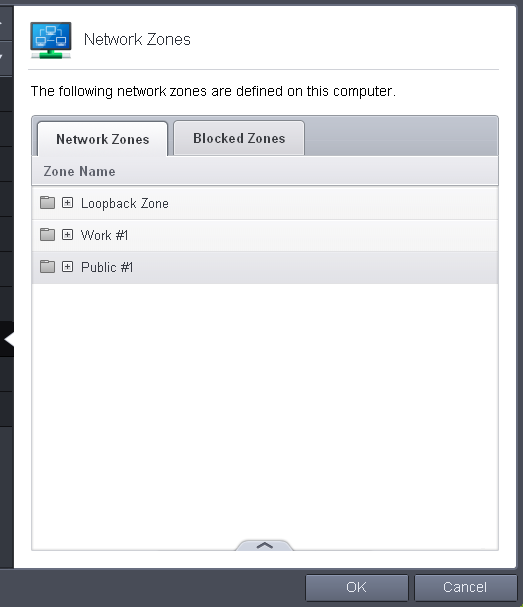 Note 3: A network zone can be designated as 'Blocked' and denied access by using the 'Blocked Zones' interface. (An example would be a known spyware site). Note 4: An application can be assigned specific access rights to and from a network zone when defining an Application Rule. Similarly, a custom Global Rule can be assigned to a network zone to all activity from a zone. Note 5: By default, Comodo Firewall automatically detects any new networks (LAN, Wireless etc) once you connect to them. This can be disabled by deselecting the option 'Enable automatic detection of private networks' in the Firewall Settings panel. Step 1 - Define a name for the zone. Step 2 - Select the addresses to be included in this zone. 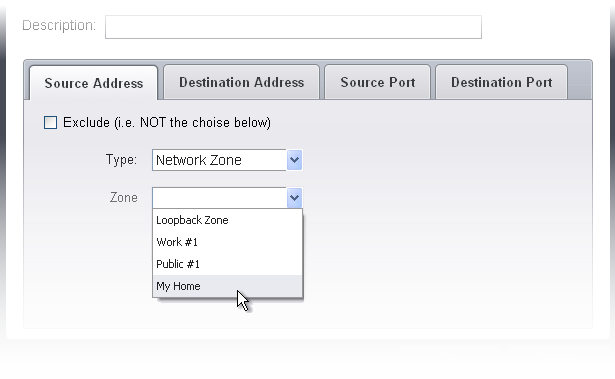 Click the handle from the bottom center select 'Add' > 'New Network Zone'. A dialog box will appear, prompting you to specify a name for the new zone. Choose a name that accurately describes the network zone you are creating. 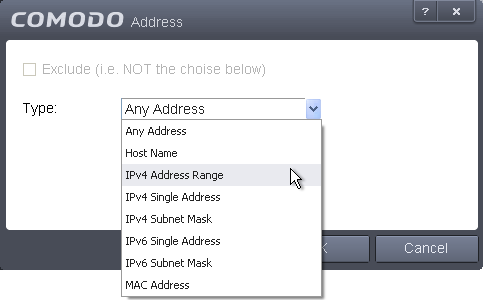 Select the checkbox 'Public Network' if you are defining a network zone for a network in a public place, for example, when you are connecting to a Wi-Fi network at an airport, restaurant etc., so that Comodo Firewall will optimize the configuration accordingly. Click 'Apply' to confirm your zone name. This adds the name of your new zone to the Network Zones list. The 'Address' dialog allows you to select an address from the Type drop-down box shown below (Default = Any Address). The Exclude check box will be enabled only if any other choice is selected from the drop-down box. Click 'OK' to confirm your choice. Click 'OK' in the 'Network Zones' interface. The new zone now appears in the main list along with the addresses you assigned to it. Select the name of the zone in the list (e.g. My Home), click the handle at the bottom center and choose 'Edit' from the options or double click on the network zone name. Edit the name of the zone. Add new address from the 'Address' interface. Edit the address from the 'Address' interface.